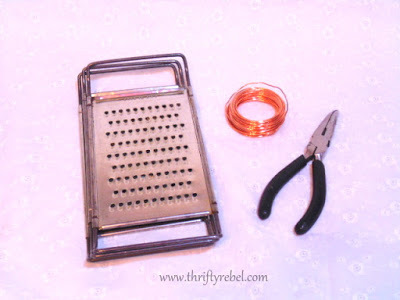 In this Finds of the Week post from a while back I showed you some vintage cheese graters that I thrifted. I knew exactly what I wanted to do with them, but didn’t know how I was going to do it. 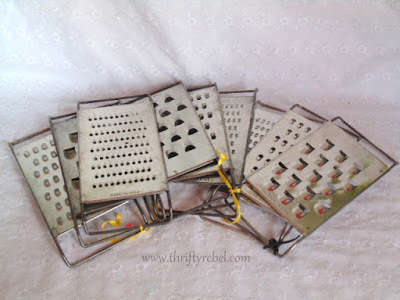 There were three sets of three graters with three different sizes of holes. This is pretty much the story of my repurposing life. lol. I can often see the end result long before I know how to get there, and sometimes I never get there… but it’s fun trying. Then one day at the hardware store I saw this…. 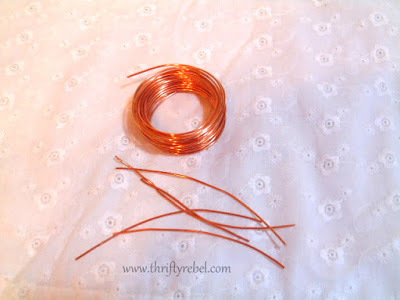 beautiful shiny flexible, but strong, copper wire…. and I knew this wasn’t going to be one of those never times. 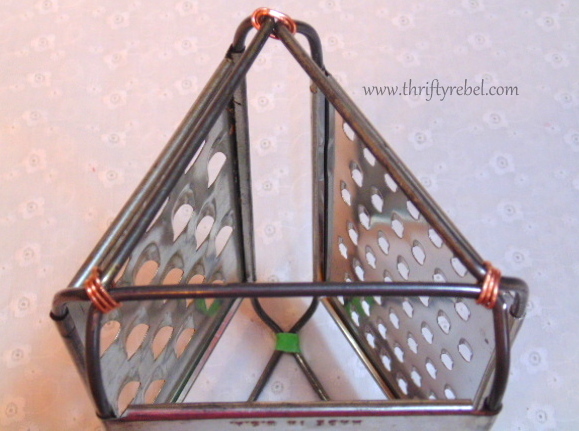 All I needed for this project was three graters, my lovely copper wire, and some needle nose pliers. I could have used three of the same size graters, but I thought it would be more interesting to use three different ones. To start I had to stabilize my graters so I wrapped the corners with thin strips of painters tape. and around three times… making sure it was tight enough to be secure, but not too tight. 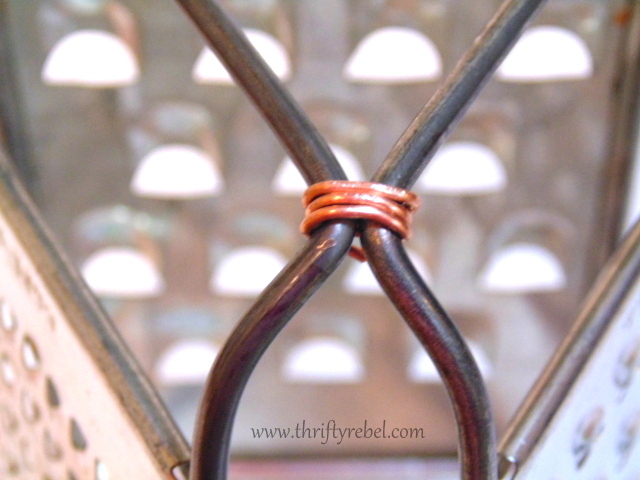 Then I just used my pliers to press the ends in nice and snug underneath. This is the bottom…. done. 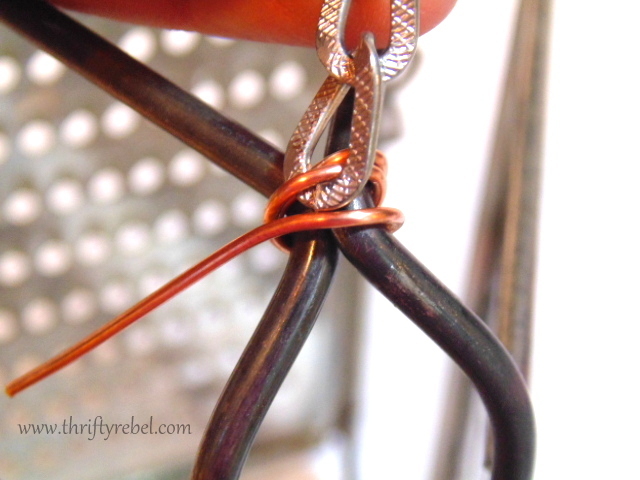 I found some chain in my stash to use for hangers, and I ran the copper wire through the bottom loop of the chain on the second time around. 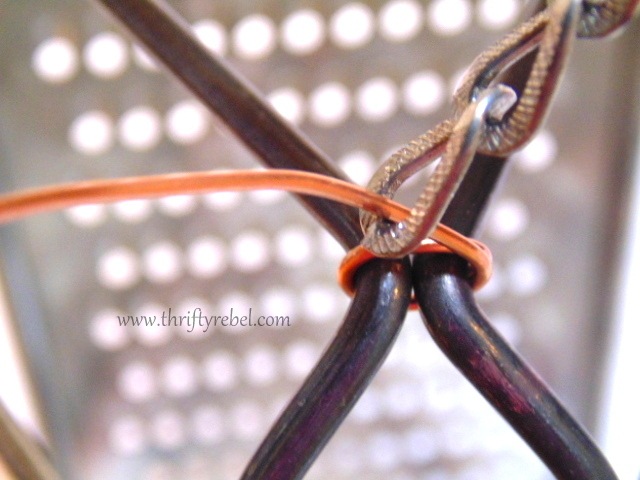 Then I wrapped the copper wire around just like the bottom corners. 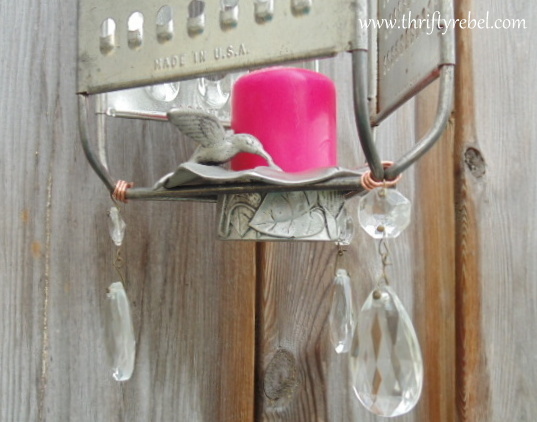 This pewter hummingbird tealight holder from my stash fits perfectly in the bottom, and it slides out easily if it ever needs to be cleaned of wax. I added a few vintage glass chandelier crystals for some bling, and a pinkalicious candle to finish it off. I love pink and silver together, but I pretty much love pink and anything together. lol. Here are a few night shots. I really love outside candlelight. 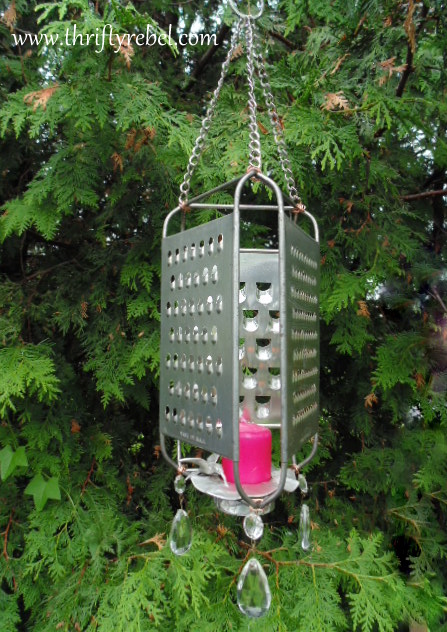 A few years I turned an ugly chandelier into an outdoor candelier. 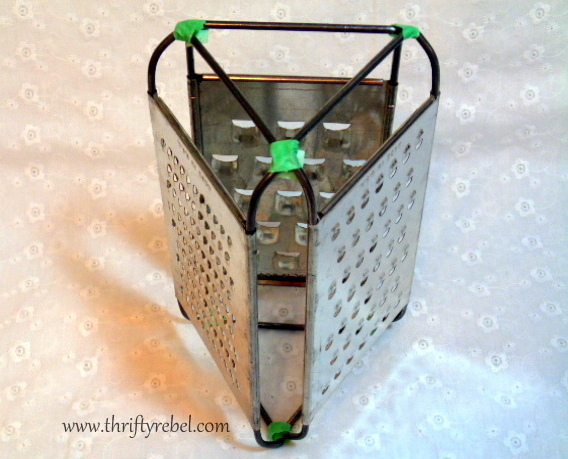 No vintage cheese graters were harmed during the making of this project. lol. 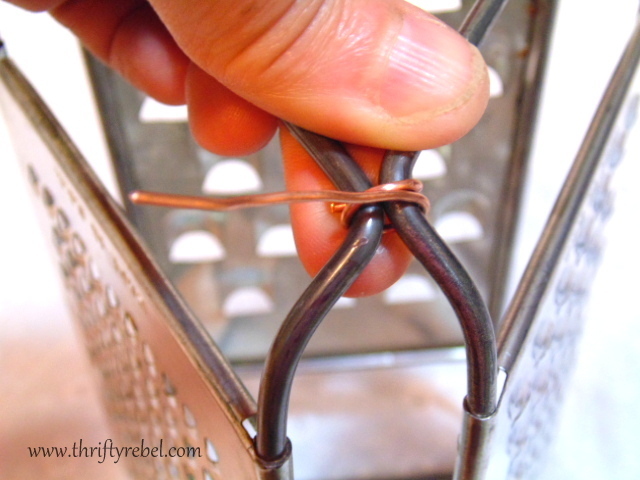 The copper wire can easily be removed with pliers and the cheese graters will be free to grate once again… or be made into something else. Hmmm… Now I have a few ideas for the other graters. Thanks so much for reading, and please always exercise caution when dealing with lit candles. Never leave them unattended. Until next time… keep on keepin’ on. Other Garden projects in case you missed them. Fun! I love old graters! Wow! That's really thinking outside the box! What a unique candleholder or lantern! 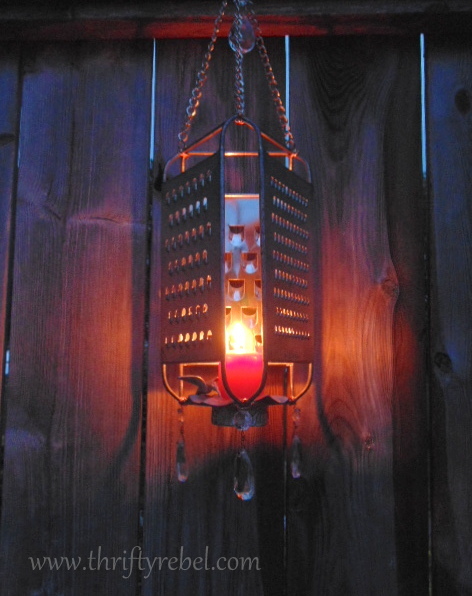 Once again, you've come up with a fabulous idea – this time using vintage graters!!! Very cool idea! I have one, and now my wheels are turning! Tuula you never stop amazing me with your creativity. This is a very cool idea. Love it. You are a genius! So cute! How lovely Tuula! So creative! This is a winner! I am thinking you need to make one for Christmas. neat! especially love it at night. Thanks so much b! It was kinda hard to get the night pics, but I did my best. What a clever idea! I love this idea and the addition of the crystals. I'll never look at a cheese grater the same way again. Thanks for the inspiration and for sharing at Vintage Inspiration Party. 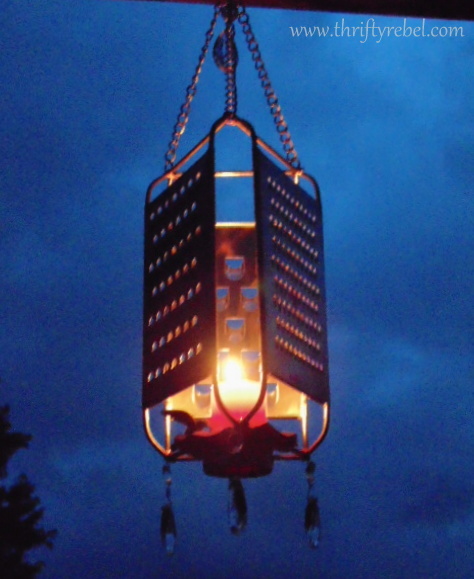 very cool recycled project, I love seeing pictures of it lit up!! Thanks Dona! I have to say that I did have a little trouble taking those night shots, but they're not too terrible. lol. Thanks Diana! I hope you had a wonderful 4th! You are just so clever!! It turned out great! This is so, so, so cute and clever, my friend! I always look forward to your posts because I know you will share something fun and unique. Thanks for sharing with Roses of Inspiration. Hugs! Hi Tuula and Happy Monday! I wanted to let you know that this post will be featured at today's Roses of Inspiration….thanks for sharing your loveliness with us! Hugs! This is very clever! Fantastic idea! You are amazing! Check out my post tomorrow… you're featured! This is absolutely a great idea! 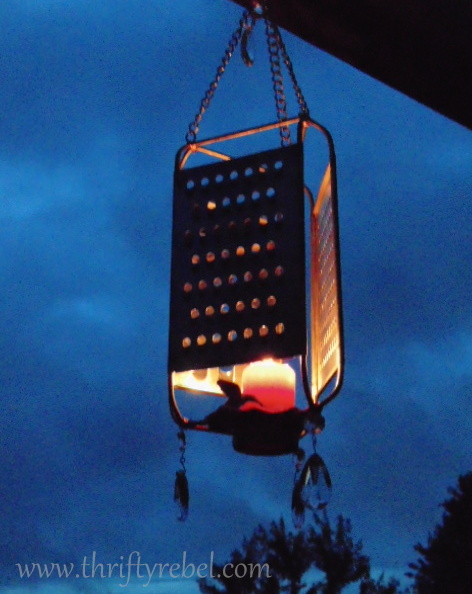 I have a couple of these old graters but never thought to use them for this adorable hanging "lantern"! Tuula, this is so clever! Love it! 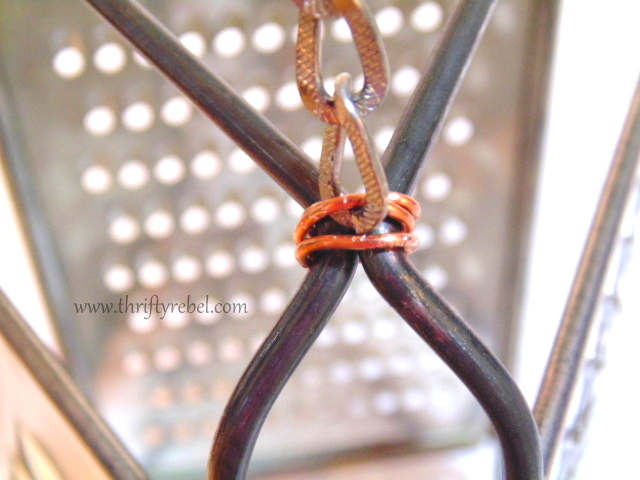 Love this idea Tuula. It's so darn cute! Thanks for sharing it with SYC. I will be featuring you this week. Never would have thought of this! Great idea. Visiting from Roses of Inspiration. Thanks so much Melissa! I appreciate you popping over for a visit. It's fabulous Tuula – and really comes alive at night – what a beautiful piece ! I would never – not in a million years – think of the garden art you create – just magical ! 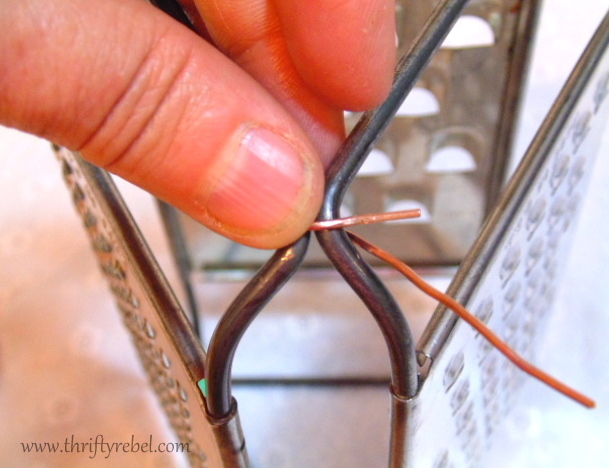 What a very clever idea to repurpose graters into candle holders! So fun and pretty. What a cute idea!! Thanks for sharing at Home Sweet Home! OMGEE, love this, Tuula! Thanks for all the great closeup shots, too! Thanks Michelle! You’re so welcome.